Spinning out of JUSTICE LEAGUE VS. SUICIDE SQUAD! Rustam, Amanda Waller's long-long prot�g�, returns to burn down the world Waller has sworn to protect. Plus, Waller wants something only Lex Luthor has. Striking a deal won't be easy-or cheap! 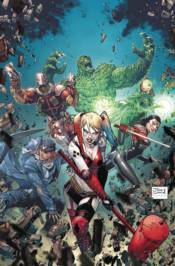 Collects SUICIDE SQUAD #9-20 and the WAR CRIMES special!